2 cans (about 3 cups)chickpeas. 1/3 cup fresh lemon juice. paprika or red hot pepper for garnish. Place all all ingredients in a food processor. Top hummus topped with a little olive oil & sprinkle with paprika or red hot pepper . Serve with pita bread ,naan bread or try it with meedo's funky flat bread. Well, I wanted to ask you guys, With what do you usually have this Hummus with?.. It looks yummy. Yum, who doesn't love hummus!!! It's so expensive to buy pre-made but It's sooo darn good! I will be giving this a try, maybe I won't have to buy it pre-made anymore :D Your picture is really great too!!! I just love hummus... thanks for the recipe. I will try it soon! gloria,thank you for the comment. Hi mona,Serve it with pita bread ,naan bread or try it with meedo's funky flat bread. Hi meeso,thank you so much for the comment,give it a try and see if you like it. it's very easy & quick to make.if want the original flavor just add garlic. I'm so glad that you try it & you like it too. next time I'll post recipe for Baba Ghanoush(moutabal). delicious, I am always to lazy to make hummus, you make me want to make it. Love your blog. 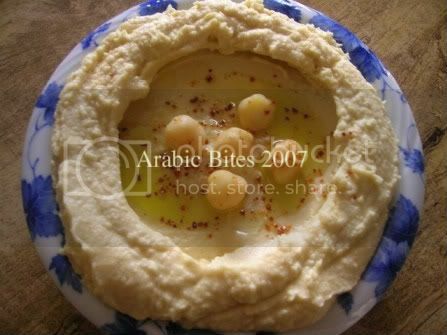 Hummus is one of my favorite Arabic dish. It's difficult to buy Tahina in the Philippines but when I was in USA it was easy to but it the middle eastern shops. I'll try to make some of your recipes. Thank's a lot for sharing. Photos, Original Recipes, and Text © Copyright: 2007-2009 Arabic Bites by Zainab & meedo .If you re-post a recipe, please give credit and post a link to this Blog.